The Greg Norman Signature Golf Course at Vidanta Nuevo Vallarta encompasses the finest in golf with unsurpassed care and conditioning of the golf course plus exceptional Paspalum golfing surfaces. The exciting course layout follows along the banks of the Ameca River and every hole offers exceptional views of the Sierra Madre Mountain Range. Generous fairways off the tee give way to large rolling greens that are protected by immense bunkers, which is totally in character for a Greg Norman golf course design. Indigenous trees, native grasses and jungle surround the core course layout, which is uninterrupted by housing and civilization throughout. As challenging from the championship tees as it is forgiving from the forward tees, the Norman course offers four different options for players. All this and a trip across the world’s longest golf cart suspension bridge spanning the Ameca River from Nayarit to Jalisco, and you’ll not experience a round of golf like it anywhere else in the world. The Golf Course offers 88 bunkers and 15 lakes. Golf Course Design: Greg Norman. 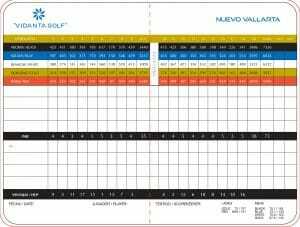 See all our Nayarit Mexico golf courses.